Are you investing in enough ammo? I'm sure we could all use a little boost in our portfolios, and make sure you have plenty of diversity. Look what this guy did-and he's in CHINA!! 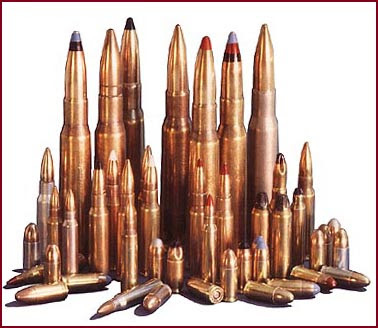 Some time ago Boston T. Party's Gun Bible established the goal for ammo resources for us all. If memory serves his recommendation is 10k rounds for each rifle in your armory, 5k rounds for each pistol, and 5k rounds for each shotgun. I don't own that much, but I'm working on it, you should too in my opinion. I don't think Boston talked about this, but you should own a number of rifles with which to equip a certain number of your tribe who might not be able to "feather their nest" at the level you can. For example, I have a friend who will prove valuable in any future scenario, but he is young, married, with four children, all under the age of six years. Trained in farm management, he can't find employment (now) in that field, but possesses valuable information. Those are the kind of folks we need to plan for. Oh, yes, there's Ammoman.com, true he has a lot of berdan primed, steel cased ammo, but he has the "good" kind too. Worth a look. A couple of sites I use to get ammo is "ammotogo.com" and "luckygunner.com". I have used both and was pleased with both of them. I even ordered ammo on Friday at 3pm from "luckygunner.com and it arrived the very next day. No backorders on this site either. If you order ammo a computer subtracts your order from their inventory and this means you dont have to wait for them to get ammo in before they ship it to you. If you ordered it, they ship it to you. Ammotogo is out of Texas and they have a huge selection of rifle, pistol and shotgun ammo. Check out the Dupleks 12 GA shotgun shells that come apart on contact. Its the end of the trail for anything you shoot with one of these shotguns slugs. Put another way, shoot'em and forget about them, they are dead, dead, dead!